Bilel Chaouachi. Courtesy of Kapitalis. 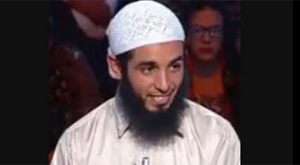 The Tunisian government arrested Bilel Chaouachi, a Salafist imam who has openly praised Osama bin Laden and Ayman al Zawahiri, earlier this week. Chaouachi was allegedly involved in the storming of the US Embassy in Tunis days after terrorists struck the US Consulate in Benghazi, Libya. “Bilel Chaouachi is suspected of involvement in the September 14 events of the attack on the embassy and the American school, but before that there is another case pending against him for incitement to violence,” Tunisian Interior Ministry spokesman Khaled Tarrouche explained, according to Kapitalis. The rabblerousing Chaouachi has garnered more influence in recent months, culminating in a shocking appearance on Ettounsiya TV shortly before his arrest. Salafists have clashed with the Ennahda government in recent weeks, leading to an escalation in violence. Chaouachi was unapologetic, however, claiming that the government was at fault. He also stunned viewers by openly praising al Qaeda’s leaders. “We, the jihadist salafist movement with our scholars and theoreticians headed by Sheikh Osama bin Laden, may Allah have mercy on him, and Sheikh Ayman al-Zawahiri, may God protect him, say that this country is a land of preaching and not a land of war, even when it is not ruled according to Islamic law,” Chaouachi said during his television appearance, according to Magharebia.com. Chaouachi has advocated for jihad against Bashar al Assad’s regime in Syria. “It is the duty of all Muslims to support the struggle of the Syrian people against despotism,” the Associated Press quoted Chaouachi as saying earlier this year. Chaouachi is not the only Ansar al Sharia member implicated in the storming of the US Embassy in Tunis. The head of Ansar al Sharia Tunisia is Seifullah Ben Hassine (a.k.a. Abu Iyadh), who is also wanted in connection with the Sept. 14 assault. Hassine has longstanding ties to al Qaeda. In 2000, Hassine co-founded the Tunisian Combatant Group (TCG) “in coordination with” al Qaeda, according to the United Nations. The TCG helped execute the Sept. 9, 2001 assassination of Northern Alliance leader Ahmed Shah Massoud, who was killed by two Tunisians pretending to be journalists. Massoud’s assassination was an integral part of al Qaeda’s Sept. 11, 2001 plot, as it removed an influential adversary from the battlefield before American-led forces set foot inside Afghanistan.